Laxmi Vilas Palace is my most visited place in Vadodara. 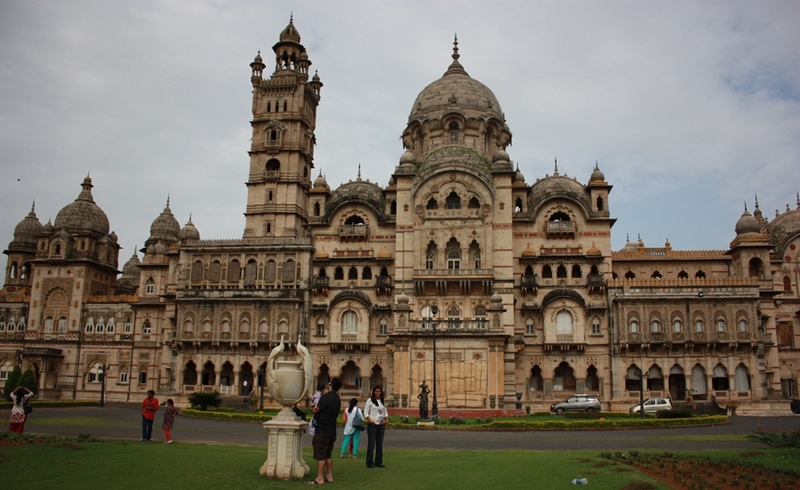 Initially I knew of only a few places to see in Vadodara, so whenever somebody visited us, Laxmi Vilas Palace was the one place where we definitely took them. Last week was my 5th visit to the palace. Every time I go there, I come back thinking I should write about the palace and soon forget about it. But not this time :). The ticket for the palace is a bit expensive at Rs. 150 per person but then you get a free audio guide and a postcard along with it! J The audio guide is very helpful. I have tried both English and Hindi and I would recommend the Hindi as it’s more beautiful to hear about the palace in it. The guide is timed well, guiding you from one room to another with all the stories about the palace and the royal family. The only thing I didn’t like was that photography is not allowed inside the palace and all the grandeur and beauty is just for the visitor and can’t be shared. 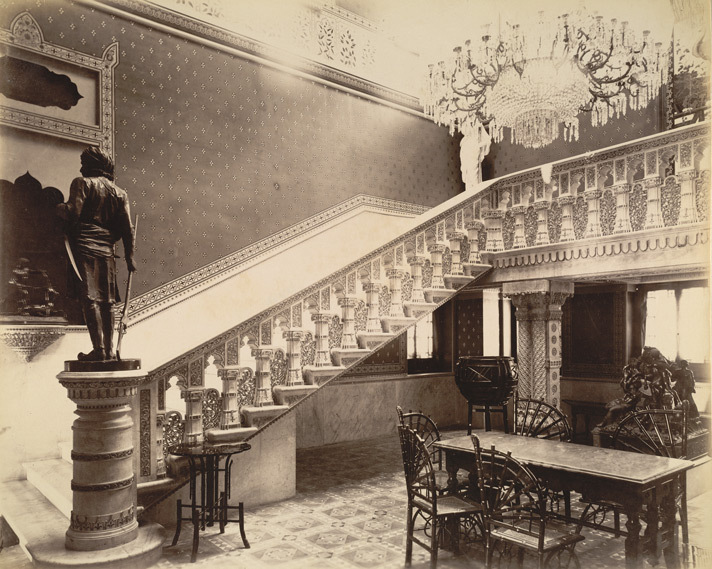 I have put up some old photos of the palace from the web. Outside the palace there is a huge, sprawling garden which is also the Baroda Golf Course. Once inside, one is greeted in the entrance hall by a huge vase resting on marble mermaids and protected by half men-half horse staues. Wonder what was the use of this vase. The hall has reliefs and statues by the Italian artist Felici.. As you move inside, every pillar, every balcony is beautifully engraved from top to bottom. In the carvings are also engraved the symbols of sun and cow. The sun because the royal family is Suryavanshi (descendants of Sun God) and cow because they are Gaikwads (protectors of the holy cow). Not just the pillars and balconies; all the windows glasses are also beautifully etched with MSR’s signage and scenes from hindu mythology. Actually one of the balcony (the one leading to the private residence) is engraved by signor Felici himself! The arms room (Shastragrah)is impressive. The collection was put together by Raja Pratap Singh and first displayed publicly in 1941. Admire the swords, pistons, appears, chakras and secret weapons. But more than that the stories told by the audio guide are very interesting. The most celebrated weapon in the collection is a sword called NavaDurga – on it are engraved the 9 incarnations of Goddess Durga. Durga represents the victory of good over evil; as this sword was destined to do. Other weapons include Aurangzeb’s sword; Shivaji’s wagh nakh; Guru gobind Singh’s sword. Then comes the Gaddi Room (coronation room). When I first went to the room I was amazed by the simplicity of the room. 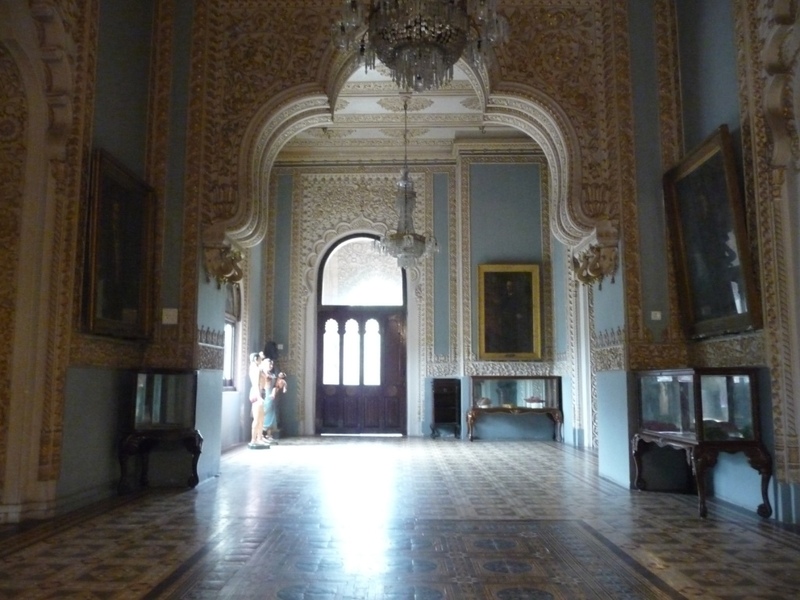 Normally the throne room is one of the most flamboyant rooms in any palace, but it was just opposite. The throne is simply a huge cushion. There are no chairs in the room… everyone sits on floor. The walls are adorned by Raja Ravi Verma’s paintings depicting scenes from Mahabhrata and goddess Laxmi and Saraswati. As we moved along the corridors, there were statues and paintings by artists from parts of the world showing Maharaja’s rich taste in art. The palace is a mix of both East and West styles both in architecture and arts. Every room of the palace is oozing in royalty and richness. Even the Hathi Room, the room from where the Maharaja alighted his elephant! The Darbar Hall (Assembly room) is the most beautiful of all in the palace. 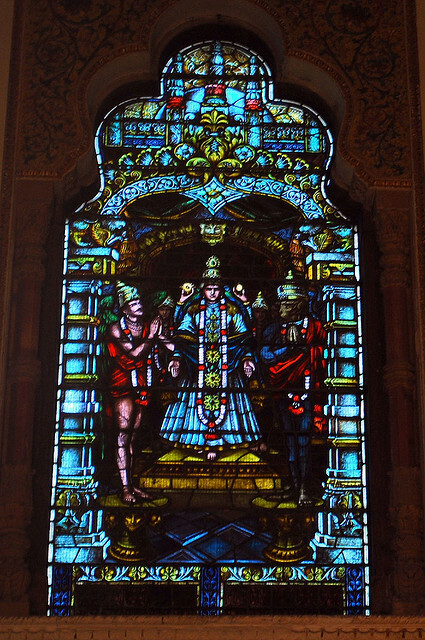 98 ft long room with mosaic tiled floor; 7 ft long stained glass windows; statues of past rules and wall reliefs. 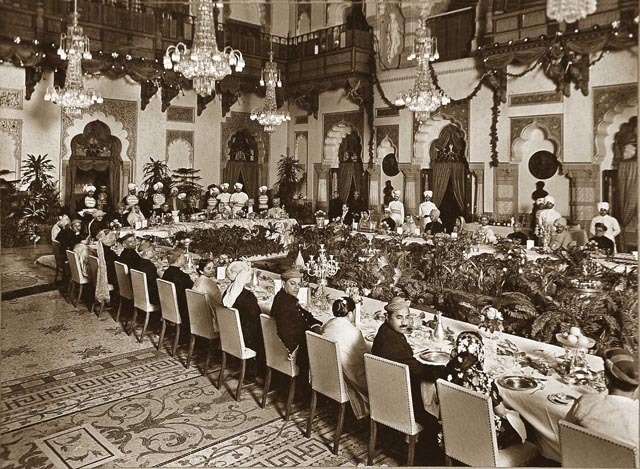 Here’s an image of a royal banquet held in the hall in 1934 from Lassi with Lavina. I have tried to remember as much as I can of what the audio guide told to share the beauty in words! For the real thing, do visit the palace if you are town! Lovely! I have been there 4 times too. I dunno about the guests I dragged there, but I loved it more and more every time! The balcony area and Darbar rooms are my fav. Lovely pics and description. Looking forward to more from you! i been there more than 10 times, but still not satisfied, i want to see the palace more and more.- Alpesh Amin. Haunted by whom nonu? 🙂 it’s the one of the few palatial residences still in use by the royal family!